I have created this post for my students to learn the seven days of the week. They are not difficult to remember but some students confuse them. In this post there is a simple infographic, a song, a worksheet and two games. I hope you like this post and find it useful for your students too. This song is by my friend Jules from English Through Music Madrid. I like it and it helps introduce the topic. Introduce the way the days are spelt in the following infographic. Print the following worksheet and hand it out. In the first part, students translate the words and copy the red words into the squares provided. The aim of this activity is to give students an opportunity to practise the spelling of the words. The other three activities are puzzles. In the first crossword students have to complete the crossword with the days Monday to Saturday. In the second wordsearch, students should find the seven days of the week. In the third crossword students should fill in the days of the week according of the clues provided. The first game is called Teacher Invaders. In this game you should type the correct day of the week and then you try to shoot all the invaders. The invaders look a lot like the teachers, but we do not mind as long as you learn all the words :-). Good luck. The second game is in Flash and will play only on desktop computers, too. It is called Half a Minute, and your task is to type the correct answer before half a minute runs out. Enjoy. 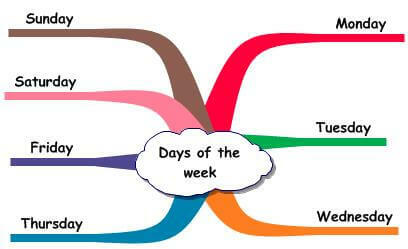 You will find great activities to teach Days of the week at British Council site.